This page answers questions about delivery deadlines, shipping questions, and shipping specific items. What are the ordering deadlines for Easter? 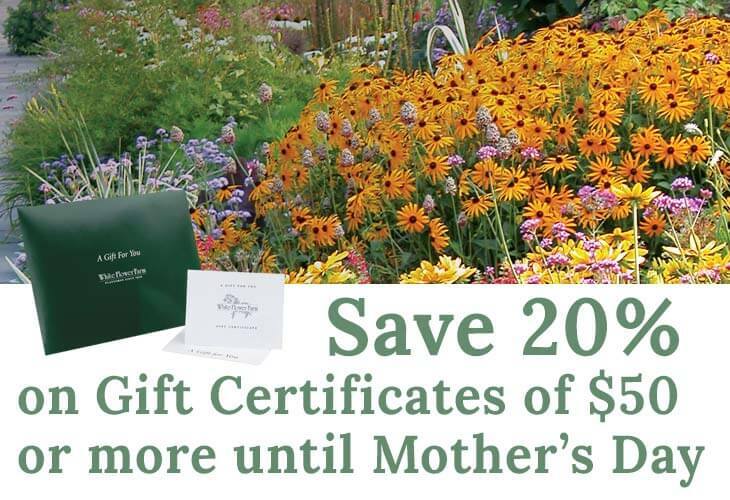 What are the ordering deadlines for Mother's Day? When will my spring order ship? When will my fall order ship? When will my holiday season order ship? How are gift messages delivered? Can I indicate when I want my order to ship? Can I postpone shipment of my order? Do you ship overseas or to Alaska, Hawaii, or Canada? How do Agricultural Regulations/Restrictions/Quarantines work? Can you deliver to my business address? Can I request that an item ship earlier for my planting zone? When will my hardgoods (non-plant) items ship? When do Lily of the Valley pips ship? When do South African Amaryllis ship? When do Tuberous Begonias and Dahlia tubers ship? When do Scented Geraniums ship? When do Tomato and Pepper plants ship? Please note: We can no longer deliver any orders to Alaska, Hawaii, APO/FPO/DPO addresses, Puerto Rico, the Virgin Islands, or addresses outside the United States. Please note: If very cold temperatures threaten the safe delivery of plants or bulbs, we will send a card for the holiday, and ship the plants as soon as they can be delivered safely. We are sorry but we cannot deliver plants or bulbs to Hawaii, Alaska or APO/FPO or DPO addresses, or ship any orders outside the contiguous U.S. Please note: If very cold temperatures threaten the safe delivery of plants or bulbs, we will send a card for the holiday, and ship the plants as soon as they can be delivered safely. Shipping times for other potted indoor plants may vary and most cannot be Express or Priority shipped. We are sorry but we cannot deliver plants or bulbs to Hawaii, Alaska or APO/FPO or DPO addresses, or ship any orders outside the contiguous U.S.
Our shipments may travel via UPS or by Priority US Mail. We require a street address for delivery. Large or heavy items are generally shipped via UPS. We ask that, when possible, you please provide an address where a daytime recipient is available. We cannot be responsible for delivery problems due to incorrect addresses. Please check that you have typed in the correct address and ZIP code. The size of the plants we ship has been selected to reduce the shock of transplanting. For some, this means a large, bareroot crown. Others cannot travel bareroot or transplant best if grown in containers. We ship these perennials in 3 inch or 1 pint pots, except as noted. We must point out that many perennials will not bloom the first year after planting, but will the following year, amply rewarding your patience. We ship bulbs as dormant, bare bulbs, sometimes with some wood shavings or moss. Shrubs, Roses, vines, and other woody plants may be shipped bareroot or in 2 quart or 1 gallon pots. The size of the pot is noted in the individual description for each item. We ship our spring-flowering bulbs and plants ordered from our spring catalog and website at the right time for planting in the spring, beginning in early March for warmer zones. The exact time varies by climate zone. Your order may arrive in more than one shipment, but this will not affect shipping charges. We begin spring shipping the most cold-tolerant, dormant perennials in early March to Zones 7-9, with Zone 5 commencing in early April; less cold-tolerant annuals and perennials start shipping in April, in the latter part of the month to Zones 5 and 6. To find your hardiness zone, click the link in the upper right hand corner of the website that says FIND HARDINESS ZONE. If we have your email address on file, we will notify you when your order is shipped. We ship orders placed from our fall catalog and website at the proper time for planting in the fall, shipping to colder zones first beginning in early September. The exact time varies by climate zone. Your order may arrive in more than one shipment, but this will not affect shipping charges. Daffodils, Tulips, and other spring-blooming bulbs are shipped in the fall. Click here to find your hardiness zone. All items ship weather permitting, meaning that we watch the weather to make sure it isn't too cold to ship your plant anywhere along its route to you or your giftee. We want our plants and bulbs to arrive safely for you and your friends and family to enjoy. We ship orders placed from our holiday catalog and website as soon as individual items become available for shipping beginning in September. Gift orders for tender plants that are sensitive to cold temperatures may very well be shipped before Thanksgiving, if the product is ready to ship and the weather permits. Spring plants listed in the holiday catalog ship in the spring only, but if requested, we will send a card for the holidays if a spring shipped plant is ordered as a holiday gift. Please note that many of our gift plants are temperature-sensitive, so we watch national weather maps as we prepare shipping schedules. If an extended period of sub-freezing weather delays gift plant delivery, we will send a card for the holiday, followed by the plant as soon as weather permits. If you have ordered spring or fall-shipped bulbs, perennials, or other plants as a gift, and requested a gift message at checkout, we will send your message printed in a card when the order ships. If you need your order to arrive by a specific day we would recommend that you express or priority ship your order. This will guarantee that your order will leave here within the next two business days and will arrive within 2 to 3 business days depending on the method of shipping you selected. Please be aware that UPS does not deliver on Saturdays or Sundays so these days are not included when estimating when your order will ship. We ship weather permitting and when it is appropriate for your growing zone. 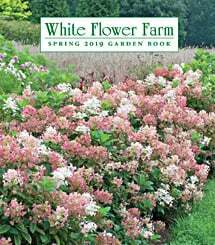 Items that do not ship directly from White Flower Farm cannot be express or priority shipped; this will be indicated in the Item Details description. If you need further assistance, please contact our Customer Service Department by emailing us at [email protected] or at (800) 411-6159. If you need to postpone shipment of your order, please contact our Customer Service Department by emailing [email protected] or calling (800) 411-6159. Please include your order number or order confirmation number and the requested ship date in your message. We will make every effort to accommodate your request, but if we have already begun to pack your order, it may not be possible to pull it back from the truck. No, we can no longer ship any orders to Alaska, Hawaii, APO/FPO/DPO addresses, Puerto Rico, the Virgin Islands, or to any addresses outside the U.S. Agricultural regulations and quarantines restrict the shipment of certain plants. When (No AL, AR, CA, ...) appears in Item Details it means these plants cannot be shipped to the states indicated. We guarantee to ship plants that are in prime condition for growing. If your order is damaged or fails to meet your expectations, we will cheerfully replace or refund it. Please contact our Customer Service Department at (800) 503-9624 or email us at [email protected]. (The office is staffed 9am-5pm Eastern time, Monday-Saturday) Please include your order number or customer number when contacting us. Sorry, we cannot deliver to a P.O. box. Please provide a street address for delivery. We can deliver to your place of business. When placing your order please indicate the shipping address you would like to use. If an item is already shipping to another zone, we can probably ship it to your zone earlier as well, but this service would be at your own risk. We do realize that in some warm zones spring bulbs may need to be chilled several weeks before planting so we do ship these bulbs earlier automatically. If you have provided us with a valid email address we will notify you when your order has shipped and is on its way to you. We will provide a UPS or Priority Mail tracking number when available so that you can track your shipment as it is en route to you. Please note that it may take 24 hours for available information from a tracking number to be updated. When will my hardgoods (non plant) items ship? Tools, hardgoods, and fertilizers are shipped with your plants or bulbs, unless you request otherwise. Our Lily of the Valley pips ship late December through June or as stock permits. Our South African Amaryllis will start shipping around early to mid-October with the Dutch varieties not shipping until around mid-November. Our Paperwhites begin shipping in late September and continue into January, as weather and stock permits. We begin shipping Tuberous Begonias and Dahlia tubers in mid to late March to all zones, because these plants perform best if started early indoors. Scented Geraniums begin shipping in mid-April for hardiness zones 7-9 and mid-May to early June for hardiness zones 2-6. Tomato and Pepper plants begin shipping in mid-April for hardiness zones 7-9 and mid-May to early June for hardiness zones 2-6.